SRT Arms offers three standard stainless steel/Inconel .223 suppressors: HURRICANE – This .223 centerfire suppressor is manufactured of stainless steel and 718 Inconel nickel based alloy components, and is for use with all ammunition and rated for burst full-automatic fire. 1/2â€³-28 thread mounted, 1.5â€³ OD and 6.2â€³ long. This suppressor delivers 33-37 dB reduction levels depending on ammunition, barrel length, and mounting configuration. Weight is approximately 22 ounces (thread mount). Compared against 19 other suppressors by an independent party, the Hurricane finished on top for best sound reduction. HURRICANE XL – .223 centerfire suppressor; 7.5″ long, 1.5″ OD, 25 ounces. The Hurricane XL brings the muzzle signature to around 127-128 dB on an 18″ barreled bolt action rifle, works equally well on semi-auto rifles and limited FA. 1/2″-28 thread mount. You will not find a more quiet suppressor than this. The Hurricane XL and Hurricane XL TI are also rated for .22-250 use. The Hurricane is also available with a quick detach system (replaces the flash hider) for an extra $165.00. For more specific information on the quick detach (QD) system, please visit our .223 quick detach page. 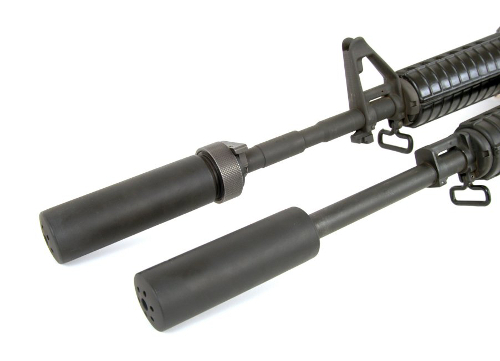 TYPHOON – This .223 centerfire suppressor is 4.7″ long (thread mount), 1.5″ OD, 17 ounce weight. Its intended use is for entry team carbines where overall length is a major consideration. 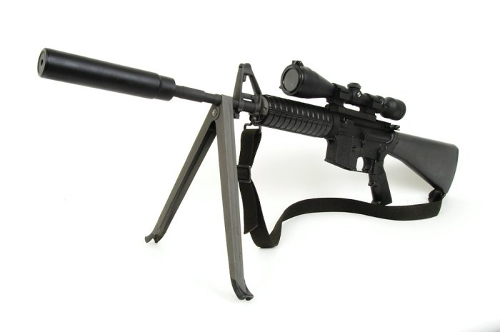 Adding only 4.1″ past the barrel muzzle, an 11.5″ barrel AR/M16 style carbine would have an overall suppressed barrel length of less than 16″, and is still quiet enough to be be fired inside a building without hearing damage. Suppressed SPL’s of 137 dB on a 16″ barrel, 139 dB on a 14.5″ barrel, and 141 dB on a 11.5″ barrel AR, shooting M855 62 gr ammo will be obtained 1 meter to the left of the muzzle. dB levels at the shooter’s ear are all below 140 dB, even with the 11.5″ barrel. Titanium Hurricane TI, Hurricane XL TI and Typhoon TI – Same dimensions as regular Hurricane, Hurricane XL and Typhoon. All three cans still have Inconel blast baffles. ATLAS UNIVERSAL TYPHOON – The Typhoon suppressor has the Patents-Pending Atlas Universal mount (AU2) which attaches the Typhoon suppressor to any Mil-Spec A2 flash hider. No tools required. AU2 Mount – The AU2 mount is so good at reducing blowback of gases into the AR/M16 platform, that minimal residue was noticed on unfired ammo in the magazine, and no gases were blown back into the shooter’s face, on guns equipped with the stock charging handles. Notes on barrel length: Too short of a barrel will cause excessive bullet yaw upon muzzle exit as the bullet does not have enough speed to properly stabilize, this has been confirmed through high speed photograph and doppler radar imaging. Obviously a bullet wanting to wobble sideways through a suppressor is not a good idea, as baffle strikes may result. Though many have found satisfactory use of these suppressors on barrels as short as 9.25″, we WILL NOT warranty our suppressors against baffle strikes when fired through barrels shorter than 10.5″ due to excessive uncorking pressures and bullet yaw. These suppressors use the new patented SRT AZTECH baffle system, which has been claimed by Al Paulson, suppressor technical writer, as “one of the most innovative baffle designs since the Maxim model 1909 baffle”. The baffle is extremely strong, lightweight, and provides superior efficiency in sound suppression. These suppressors do not degrade accuracy of the host firearm, and are designed to significantly reduce gas blowback into the shooters face. Side by side comparisons between SRT suppressors, and other suppressors done by LE departments have all resulted in the comment that the SRT suppressors greatly reduce, if not eliminates gas blowback. There are no “traps’ or blind chambers to clog up on our suppressors, unlike many others that utilize coaxial areas to trap gas and improve initial performance, but which quickly and permanently clog, and then get louder. All SRT suppressors are very pleasing to shoot as no hearing protection is needed. Designed for optimum accuracy, these are superb tactical suppressors designed for professional use where accuracy, flash suppression, and noise reduction is paramount. On a proper rifle platform, group sizes of less than .5” are typical at 100 yards with the suppressor installed, using match ammo. For reference, a 34 db reduction makes the AR-15/M-16 sound like a .22 rim fire rifle firing CB long ammunition as observed by a bystander 10 feet to the side of the gun. All specifications subject to change without notice as we improve our products.